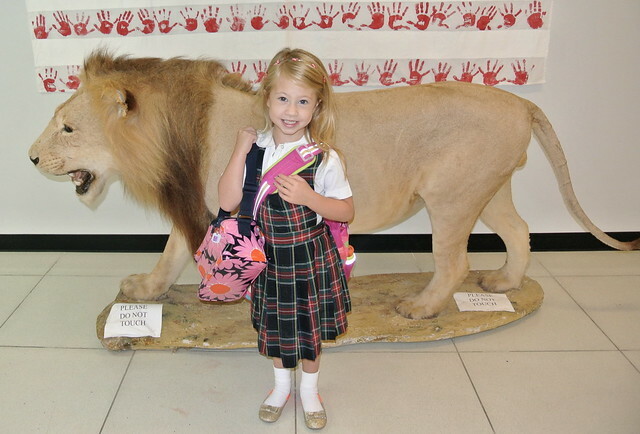 Celebrate Always: Ella's first day of Kindergarten! 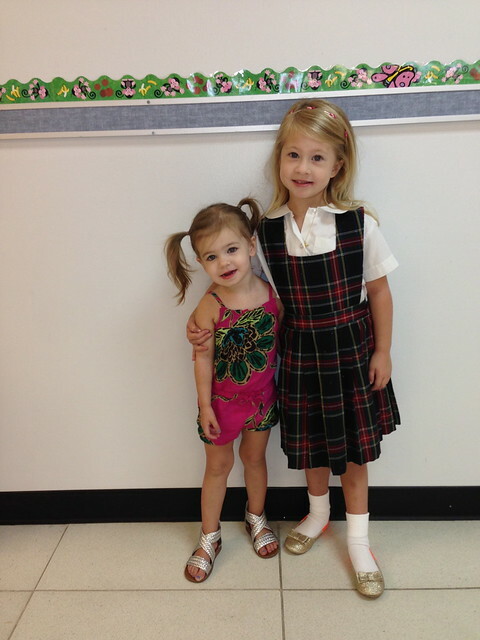 Ella's first day of Kindergarten! So crazy to even say that! Ella's first day went really great! We had meet the teacher yesterday and she seemed a little terrified. She was very quiet and I could tell her brain was spinning. I told her it was totally ok and normal to be nervous. She said she was a little bit nervous. When I asked her what made her nervous, she said it was learning her letters. Broke my heart. She does struggle with letters and sounds but we have been working on them so hard this summer and I think she is getting better each time. I am so proud of her! Speech is a big part of it and we are still in speech class every week. I know she will continue to improve, I just hate that she feels nervous about it before it even starts. I tried to reassure her how each kid learns at different times and that she is awesome and going to do great. 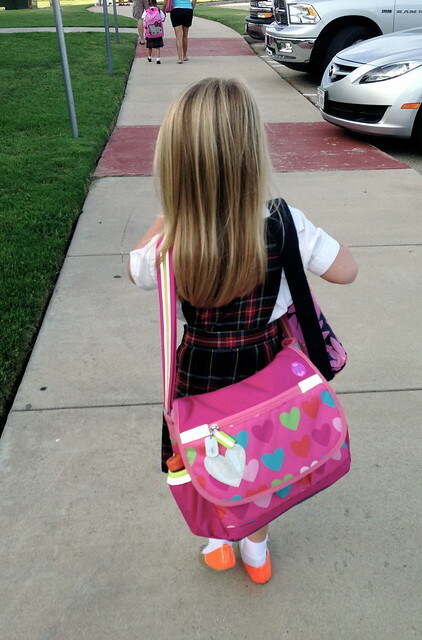 I think she felt better about it all this morning because she was giddy on the way to school. It made me oh so happy! 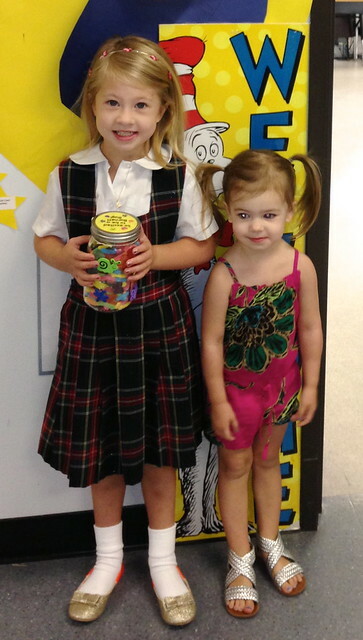 She was even loving the uniform which is HUGE for my sweet little fashion girl Ella. Our traditional on the way to school song is the Good Morning Song. Here is a little video I got at a red light this morning. Her classroom theme is Bugs. 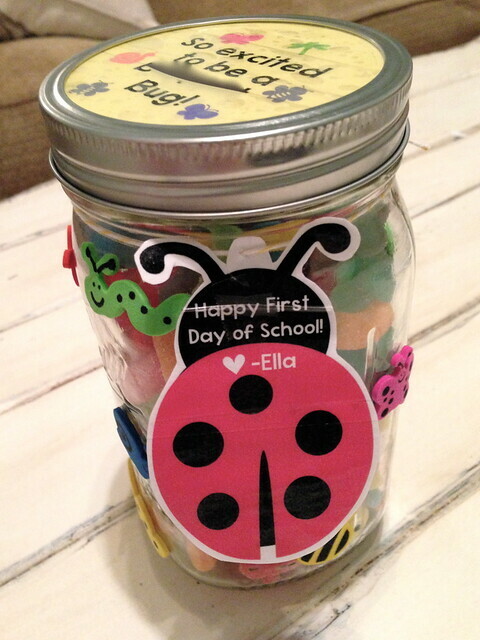 They are all called a Bug so of course I went full throttle with that and made a very cheesy teacher gift. 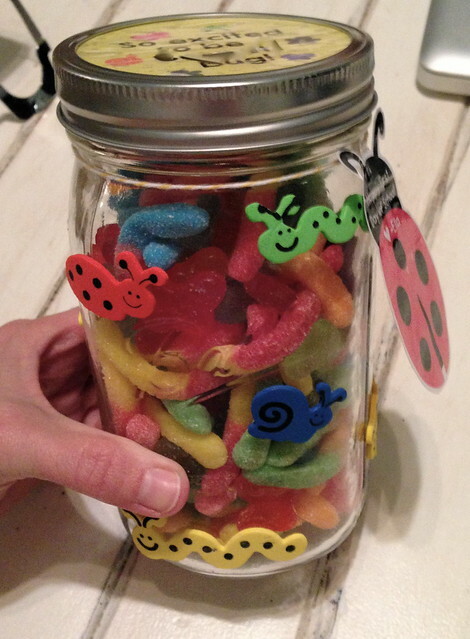 We filled a mason jar full of bug candy and covered the jar in bug foam stickers too. When I picked Ella up from school she was all smiles. She said she had a wonderful day and she even answered my 20+ questions. I am so so thankful for such a great first day! 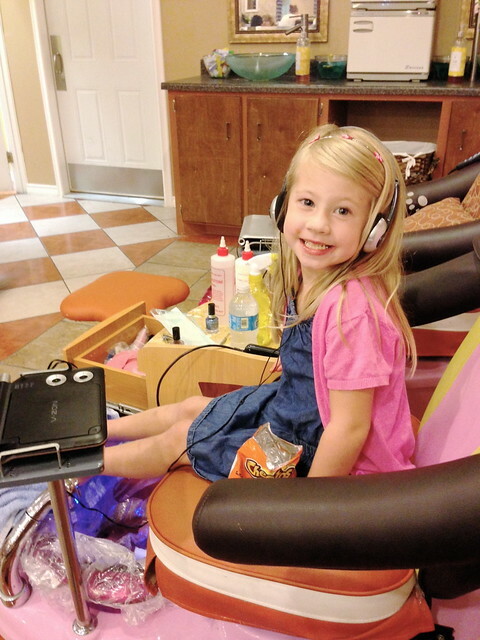 To celebrate the night before Kindergarten, Bob took Ella on a special Daddy Daughter date last night. 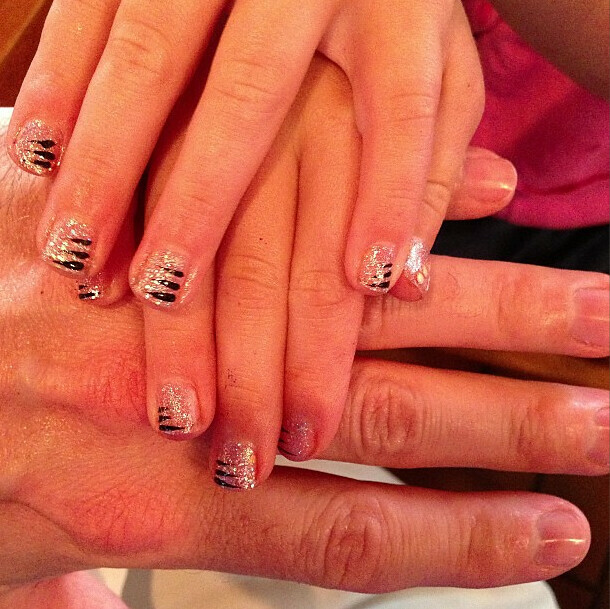 He took her to the nail salon first. He even got a manicure and pedicure with her. Ha! I would have loved to see that in action. He said that Ella was so happy. Such a great dad! Even though it looks like Bob might have a clear polish on his nail, he does not. They just buffed his nails so good that they shined! He was so funny about it. They then ended the night with Ella's favorite. Breakfast for dinner at Cracker Barrel. While they were gone, McKenna and I set up a little surprise in their room. We have moved them to two twin beds this last weekend and are still in the process of making headboards and waiting on new comforters. (more on that later) I had this old vanity that my Mamaw gave me years ago. I decided that it would be the perfect piece next to Ella's bed. She loves to express her creativity in her clothing and hair styles. Since uniforms kinda holds her back I thought it would be fun to have her own little space to fix her hair. She was so excited. She just kept saying, "Mom, I love it!" over and over. 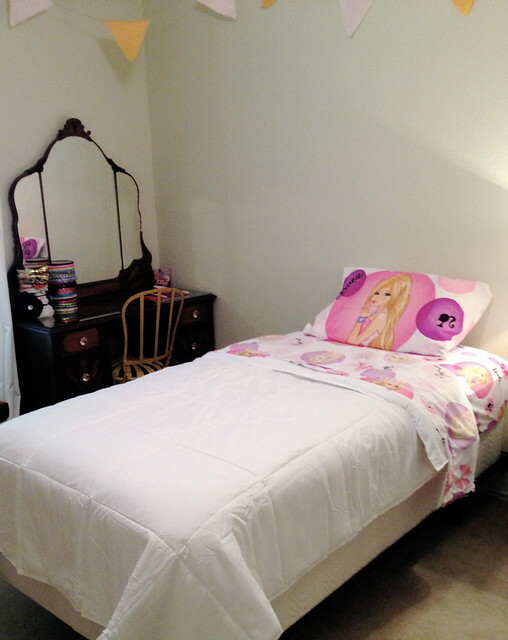 Those really cool Barbie sheets were also a fun surprise to Ella. She was thrilled! 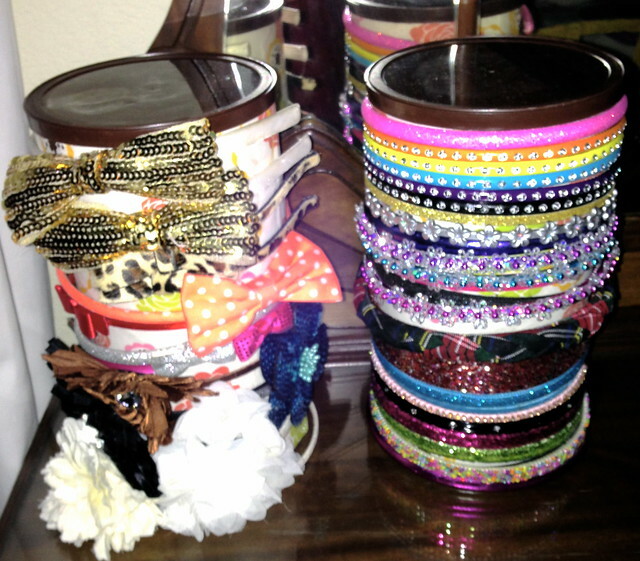 I saw the headband holder idea on pinterest. It is just two oatmeal containers that I glued fabric around. It works perfect! I think I need to make a third one already. 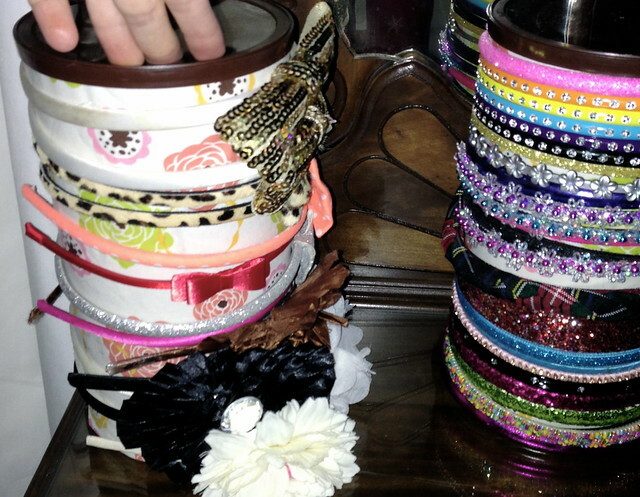 That girl loves a headband. She was so excited to be able to see them all at once. 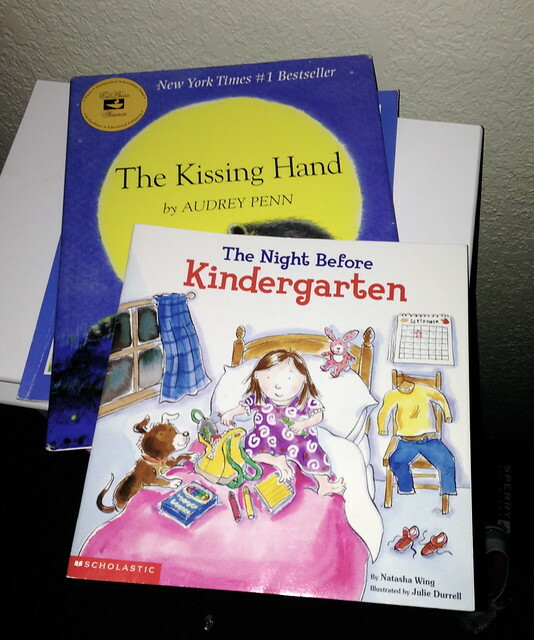 I read The Kissing Hand and The Night Before Kindergarten to the girls last night. That was the most emotional time for me. The Kissing Hand get me every time. So overall, it was a WONDERFUL first day and I couldn't be happier! Praise God! Oh Allison you and Bob are such great parents!!! Wish I did more surprises for my kiddos. So glad she had a great first day!! Isn't it strange to not have them at home?? I bet she has a wonderful year!